Price: $128,995 1600 sq. ft. This is a very open kitchen, living room plan. The virtual tour features the new Ultimate Kitchen 3. 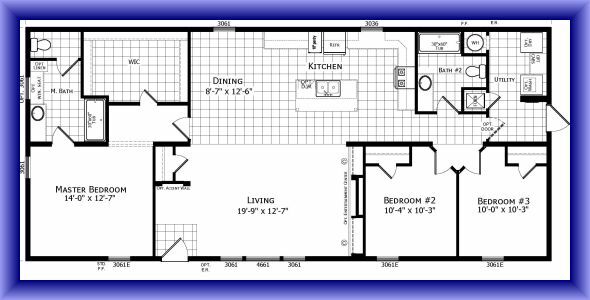 You can get an Ultimate kitchen 2 in this plan also. It also has the optional bath. This home is priced as to the virtual tour. Many of these homes that have virtual tours were at a dealer show. They equipped the home with new items that you may not want or want to pay for. The price list has what each item is and how much it is. It is possible to save thousands on the home and still get a very well equipped home. You can finance this home with as little as 5% down payment with good credit. To Start an application, click here to start the application Process. When it asks for a Dealer Number, our number is 243/1. "Let us build it your way"
Please view the printable price list (PDF, 660.19 KB) for this home.